This is a research paper I had to write for my honors English 2 class. As defined by EconomicFreedom.org economic freedom is the ability “to choose how to produce, sell, and use your own resources, while respecting others’ rights to do the same” (EconomicFreedom). As the Heritage Foundation notes “is the fundamental right of every human to control his or her own labor and property. In an economically free society, individuals are free to work, produce, consume, and invest in any way they please. In economically free societies, governments allow labor, capital, and goods to move freely, and refrain from coercion or constraint of liberty beyond the extent necessary to protect and maintain liberty itself” (Heritage). In America solutions to the problem’s faced by the population tend to involve more central planning. Common problems tend to involve unemployment, poverty or the environment. Economic freedom should be supported due to the effects on the broader economy, on individuals and on the environment. The effects of economic freedom are clear, broad and positive. The benefits of economic freedom may be most obvious by the effects on the broader economy. The Heritage Foundation has shown a correlation of point eighty between the rank on the economic freedom index and entrepreneurial opportunity (Miller). Economists found that OCED nations were at a “5% statistical significant level or better” increase in GDP adjusted for purchasing power parity and states that “the results underscore the critical role that economic freedom plays in a nation’s economic growth and prosperity” (Cebula). When controlling for other variables economists found that GDP per capita to be “positively related” with economic freedom. Research have found a “positive and nonlinear relationship between economic freedom and growth while separate research found that growth accelerations are preceded by economic liberalization (Jong-A-Pin)(Prochniak)(Gorlach). Even in Africa, freeing an economy has a “positive effect in most regions” (Billmeier). Research published in the National Bureau of Economic Research’s Working Paper Series shows that “the direct effect of financial liberalization on growth far outweigh the indirect effects via a higher propensity to crisis” (Ranciere). Similar research done by University of Central Arkansas economists find a relationship between economic freedom and economic volatility in which as a “nation’s economic freedom increase, macroeconomic volatility decreases” (Campbell). In another study the economist Richard Cebula found that a relationship between property rights (a major pillar in economic freedom) and increased growth in GDP per capita (Cebula). In the Fraser Institute’s annual economic freedom report, the effects of economic freedom is analyzed with multiple variables. The results show a correlations between economic freedom and income growth, economic growth, income share and earned of the poorest ten per cent, life expectancy and political and civil liberties. The quartile with the most economic freedom also lead with the highest rankings in all previously mentioned categories (Gwartney). The benefits on the broader economy even go down to the individual. The obvious implications on the broader economy such as less volatility or more entrepreneurial activity may leave a lingering as to why. When an economy is freer central banks and governments are less likely and have less ability to pervert economic signals which coordinate economic activity. As the Nobel Peace prize winning economist, FA Hayek, once said “The curious task of economics is to demonstrate to men how little they really know about what they imagine they can design” (Hayek, 76). An economy cannot be designed and any attempt to do so will only lead to volatility. A free economy will provide order spontaneously. An economy that is free will provide the incentives necessary for an entrepreneurial activity to occur. The benefits of economic freedom may be most obvious on the effect on the individual. The results of a study done by three economists “suggest that economic freedom is as much important for economic growth as for poverty reduction” (Rana). Using data from across eighty-eight countries economists found that “structural reforms lead to positive outcomes for labor” (Hollweg) while another study from the St Louis Federal Reserve found that “U.S. state employment growth. We find that states with greater economic … experienced greater rates of employment growth. In addition, we find that less restrictive state and national government labor market policies have the greatest impact on employment growth in U.S. states” (Garrett). Research has shown that in Sub-Saharan Africa there is a positive relation between poverty reduction and liberalization coefficients with economic growth (Yusuf). The Honors Thesis of Florida State University student Signè Thomas finds that “eleven out of thirteen measures for women’s socioeconomic status show that an increase in economic freedom is associated with an increase in women’s socioeconomic status… and my results are robust across multiple measures of women’s socioeconomic status” (Signe). Lastly when the Heritage Foundation releases the yearly Economic Freedom index, along with the Wall Street Journal, the report analyzes the effects. GDP per capita correlates with economic freedom at a trend of point frothy-two meaning that as an economy gets freer the GDP per capita rises (Miller). The average “free” economies in the Heritage Foundation’s index have a GDP per capita of almost thirteen thousand dollars greater than the average “mostly free” economy (Miller). 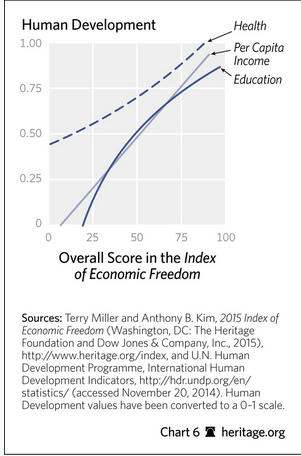 The analysis also finds a strong connection between economic freedom as measured in the index with “human development” (healthcare, per capita income and education) as seen in the chart below shows (Miller). Lastly economic freedom leads to more social progress (Miller). The foundation’s analysis found a point forty-nine trend between economic freedom and the results of the social progress index (Miller). Individual and broader economic benefits are not the only benefits of economic freedom. When economies are free people act rationally in in self-interest. When all this interaction comes together it leads to higher wages, less poverty, more equality and higher standards of living. The benefits of economic freedom may be most controversial and unknown in the realm of the environment. Joel Wood and Ian Herzog, of the Fraser Institute, found that an increase in economic freedom by one per cent translates to a reduction by 7.15% in particle matter (PM10) air pollution. The twenty highest and lowest ranking countries had a forty per cent difference in the PM10 levels in 2010 (Reuters). As the study states “Our results suggest that after controlling for the effects of many important factors in economic growth and political institutions, economic freedom has a significant direct effect on concentrations of fine particulate matter but not on emissions of carbon dioxide” (Wood). The Heritage foundation found that environmental performance steadily improved by quintile, with the exception of the fifth to forth, of economic freedom as seen by the chart below to the left (Miller). As the chart below to the right shows there is a significant correlation between economic freedom and the environmental performance of a nation (Miller). The question now is why. A common conception is that a lack of government intervention will destroy the environment, but this is a false conception. A major reason why free economies have better environments is the tragedy of the commons. The tragedy is “An economic problem in which every individual tries to reap the greatest benefit from a given resource. As the demand for the resource overwhelms the supply, every individual who consumes an additional unit directly harms others who can no longer enjoy the benefits” (Investopedia). For example if there was a common grazing area shepherds would want to maximize the use, but will expect others to care for the land (Investopedia). The economic adage goes “nobody washes a rental car” (Loris). In real life most people will not seriously take care of a resource owned by another. Economic freedom should be supported due to the effects on the broader economy, on individuals and on the environment. The benefits are clear. They are positive. They are broad. By allowing individuals too freely and voluntary interact society will advance and be better off. As Milton Freidman said “Freedom in economic arrangements is a component of freedom broadly understood, so economic freedom is an end itself…. Economic freedom is also s indispensable means towards the achievement of political freedom” (Capitalism and Freedom, 8). “About The Index.” 2015 Index of Economic Freedom. Heritage Foundation, n.d. Web. 25 May 2015. “Fraser Institute: Air Pollution Declines as Economic Freedom Rises.”Reuters. Thomson Reuters, 22 Apr. 2014. Web. 25 May 2015. “Managing Economic Volatility And Crises.” A Practitioner’s Guide Managing Economic Volatility and Crises (2005): Xvii-viii. Web. “Tragedy Of The Commons Definition | Investopedia.” Investopedia. N.p., 22 Nov. 2009. Web. 28 May 2015. “What Is Economic Freedom?” Economic Freedom. N.p., n.d. Web. 25 May 2015. Billmeie, Andreas, and Tommaso Nannicini. “Assessing Economic Liberalization Episodes: A Synthetic Control Approach.” The Review of Economics and Statistics 95.3 (2013): 983-1001. MIT Press Journal. Web. Billmeier, Andreas, and Tommaso Nannicini. “Assessing Economic Liberalization Episodes: A Synthetic Control Approach.” Review of Economics and Statistics 95.3 (2013): 983-1001. Web. Campbell, Noel, and Thomas Snyder. “Economic Freedom and Economic Volatility.” Journal of International and Global Economic Studies (2012): 60-76. Web. Cebula, Richard J. “THE IMPACT OF PROPERTY RIGHTS FREEDOM ON ECONOMIC GROWTH: EVIDENCE FROM THE OECD NATIONS.”INTERNATIONAL JOURNAL OF Economics and Research (2011): 1-10. Web. Cebula, Richard J., and J. R. Clark. “Lessons from the Experience of OECD Nations on Macroeconomic Growth and Economic Freedom, 2004–2008.” Int Rev Econ International Review of Economics 59.3 (2012): 231-43. Web. Friedman, Milton. Capitalism and Freedom. Chicago: U of Chicago, 1962. Garrett, Thomas A., and Russell M. Rhine. “Economic Freedom and Employment Growth in U.S. States.” SSRN Journal SSRN Electronic Journal (n.d.): n. pag. Web. Gorlach, Vsevolod I., and Pierre Le Roux. “The Impact of Economic Freedom on Economic Growth in the SADC: An Individual Component Analysis.” Economic Research Southern Africa 337 (2013): n. pag. Web. Gwartney, James, Robert Lawson, and Joshua Hall. “Economic Freedom of the World.” (n.d.): n. pag. Web. Hayek, Friedrich A. Von, and William Warren Bartley. The Fatal Conceit: The Errors of Socialism. Chicago: U of Chicago, 1989. Print. Hollweg, Claire H., Daniel Lederman, and Devashish Mitra. “Structural Reforms and Labor Market Outcomes: International Panel Data Evidence.” Policy Research Working Papers (2014): n. pag. Web. Jong-A-Pin, Richard, and Jakob De Haan. “Political Regime Change, Economic Liberalization And growth Accelerations.” Public Choice146.1-2 (2010): 93-115. Web. Loris, Nicolas D. “Economic Freedom, Energy, and Development.”Economic Freedom, Energy, and Development. Heritage Foundation, n.d. Web. 25 May 2015. Mendelsohn, Robert. “Property Rights and Tropical Deforistation.” Oxford Economic Papers 46 (2003): 750-56. Web. Miller, Terry, and Anthony B. Kim. “Why Economic Freedom Matters.” Why Economic Freedom Matters. Heritage Foundation, n.d. Web. 25 May 2015. Próchniak, Mariusz, and Bartosz Witkowski. “Regulations and Economic Growth: Some Empirical Evidence Based on the Bayesian Model Pooling.” (2013): n. pag. Web. Rana, M.G. Quibria, and Yangseon Kim. “Poverty and Economic Freedom: Evidence from Cross Country Data.” (2003): n. pag. Web. Ranciere, Romain, Aaron Tornell, and Frank Westermann. “DECOMPOSING THE EFFECTS OF FINANCIAL LIBERALIZATION: CRISES VS. GROWTH.” NBER WORKING PAPER SERIES (n.d.): n. pag. Web. Thomas, Signè. “The Impact of Economic Freedom on Women ‘ S Socioeconomic Status.” Thesis. Florida State University, 201. Web. Wood, Joel, and Ian Herzog. “Economic Freedom and Air Quality.” (2014): n. pag. Web. Yusuf, Muhammad, and Chinnasamy Agamudai Nambhi Malarvizhi. “Does Financial Liberalization Stimulate Economic Growth and Reduce Poverty in Six Sub-Saharan African Countries?” IJBM International Journal of Business and Management 9.2 (2014): n. pag. Web.